Because if you answered ‘YES!’ to this very question, then I’ve got a cute little project for you. Presenting the “Month of Super Short Stories” Tag Book. It all started on Friday, after going out to lunch with my sweet friend, Margie, which included a stop into the paper crafter’s sensory overload that IS Paper Source. While Margie pulled cuteness from all around the store, I focused in on one thing: these tags. So here’s the thingie I’m making (with an emphasis on making as it’s not even remotely done). I’m getting everything prepped to do a tag book that will span one month’s time and be a cute little holding pen for random everyday story snippets and photos. I will begin collecting said data on March 1. The idea of this project is NOT to jot down a story a day. Oh sure, if you’re REALLY motivated, go for it. But my hope is just to get you to record, oh…let’s shoot for, HALF of your days in a given month. And what are you going to record? Whatever the heck you want to, but the challenge is this: just pick one thing from the day you’re recording, and write down a little tiny story about it. The tags I designed for this mini-book only give you so much room to write, so the exercise is all about choosing your words carefully, and realizing you don’t need to write a thesis to adequately capture a moment/story/bit & piece of your daily life. Maybe you will write about your wild success with laundry on a Tuesday. Or the way you had a massive, institutionalization-worthy meltdown on Saturday. Whatever goes, goes. Just find a way to write a mini-record of one thing from one chosen day. Then, take a picture to put on the back of the tagger. It’s that easy. And guess what? The picture doesn’t have to have anything to do with the story, if you don’t feel the need. Why, you don’t even need a picture. Just use some cute patterned paper and the reverse side of the tag and be done. For me, my New was the gorgeous new Sultry collection of papers from BasicGrey. My Old, was these way dusty Missing Link stamps in Colonial Style 5. I’m going to use those to stamp my dates on the taggers. Beyond that, I pulled from my stash to complete the rest of the tag book cover. I’ve already printed out 15 tag pages, and trimmed them so they are ready to go come March 1. What do you think? Are you in? Want to practice recording little stories in three to four sentences or less? I will say that you certainly don’t need to buy the Paper Source tags (believe me, I get no kickback from these tags, though I wish I did!) You can print out the tag templates, and just trace your own from chipboard. But I’m telling you, the ones from Paper Source are so thick and rich! And for you nutty super alter-er people, they’ll hold up to around a pound of stuff and still be standing strong! There is a tag template download below for March (the month I’m going to do, because it’s my favorite month, because it’s my birthday month), April and May. Beyond that, if people need other months, we’ll cross that bridge when we get there. Just print them onto your choice of cardstock and trim. Finally, don’t get all hung up on the specific details of this. The idea is to wing it, people! I will be sharing some of my entries as we get into March. Cross my heart. Note: This isn’t meant to be a monthly thing, though you may just have so much fun, you’ll become addicted. Like I used to be addicted to nicotine and am now addicted to Sprite and salt and vinegar potato chips! Trimming tip: B sure to trim your tags to the inside of the black guideline, and double-check they match up size wise to your Paper Source tag cover, or the one you make from chipboard. You may have to do a little trimming here and there, but don’t sweat it. It should work. Then punch a hole on the tag, grab a jump/binder ring, and you’re ready to start telling stories. My posting will be light this coming week, and so… I wanted to leave you with something fun, and mildly meaty. Here’s to meaty little stories! Here are the templates for March, April or May. (and they’re all in brown. Sorry people, that’s the way they’re going to have to be. Brown is so neutral, really.) There is a little box on each tag, and that is for the date. Good luck! p.s. hopefully these files will work, and you guys will know exactly what to do. If not, post any burning questions here. p.s.s. the template files will print on an 8.5 x 11 paper, but don’t bleed to the edge, so they should be easy to print. I totally love this idea!! Love the sultry too, I have played with some already too and it is great….I may do this in a 4×6 format instead…Thanks for the inspiration! Very cute idea…and not so daunting! 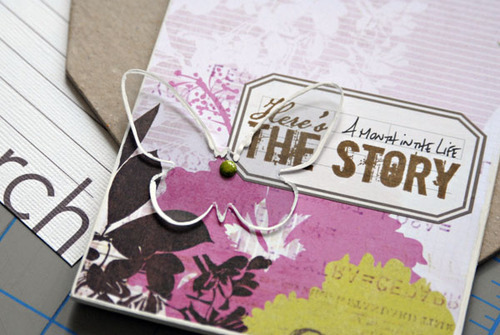 Thanks for sharing…and welcome back to scrapbooking-land! Missed your great ideas! Count me in! fun and totally doable! Thanks for the inspiration! “Like I used to be addicted to nicotine and am now addicted to Sprite and salt and vinegar potato chips!” Yep, I so hear you, except that it is ginger beer with my kettle brand salt and vinegar. I made your gratitude book for my sister for Christmas and it was the only scrapbooking I did all year. I love this idea and will do it for me for a change. this is such a fun project!! thanks for the inspiration. my friend and i have just agreed to do this. should be fun!!! oh this will be fun! i love tags and love jump rings … so this is perfect! been thinking of this anyway – may use it for a mix of things that happened and ideas for the month … another great idea! but don’t post too lightly for the week, i NEED your sense of humor! it is cheaper than therapy! I really need a little project to do for me right about now, so thankyou for this Cathy. I shall try and play along in March. What a cool idea Cathy. I will try to do this. I like the simplicity of using only 3 or 4 sentences to tell a story. I saw that you’re coming to KC in Oct. I can’t wait to meet you and take your class. Fabulous Idea…..sounds fun, yet simple….Thanks ! Will share with some friends. I’m in! thanks for the spoon-feed! Thanks for sharing your cool (and easy!) idea! We’re only talking a little, tiny story? Sounds do-able. Count me in. thanks so much for sharing this! love that new BG paper…gorgeous! Thanks Cathy, I’m going for it! Very cute idea. Love your tag design! Are you going to share more on how to do each page as far a decorating? Do we have to use butterflies? Can we use a different line of paper produts? I am totally in this one! great way to get myself back into scrapbooking! Cathy~ Thanks for sharing! This is a great idea and sounds like fun to do! Cathy- I was just thinking I needed a little scrapping inspiration, and here I have found it! Thank you thank you thank you for sharing! Can’t wait to start March 1st! I soooooo love this idea!! I can’t wait to play along! That’s such a great idea! I think even I have time for that! Thanks for sharing! This sounds like a great project! I am going to give it a try! Thanks for the inspiration! Oh cool, I’m in too 🙂 Fab project! Question: what paper size do I need to use to print those tag templates? Is it 8.5 x 11? (I’m in the UK and our standard paper size is A4 which will chop the edges off if I use that!) Thanks. oh I love this idea!!!!!!!!!!! love the template. love the Sultry paper. love Cathy Z. love March, too (it’s my birthday month as well (18th) – are you seeing the connections here (in a totally NON-single-white-female way, of course?) heehee. Love this little project, keep the months coming! Love the paper, Basic Grey just never ceases to amaze me. OK, I’m playing too, I love this!! It is adorable. But hey, did you buy up all the tags, because when I looked at them at the site, they are sold out!! 🙂 I’ll check back tho w/ Paper Source. Count me in, I am a March baby too, and I need to get the hang of this whole mini book process. Burning Question: what trimmer is pictured? I am on the list for a genesis, but seems like that is never gonna happen. The graphics on the tag are great! Thanks for sharing this! Free is always so nice! thanks for the awesome project and templates! Would you ever consider doing a tutorial on the way you set up your templates?? What program do you use to set the exact size of the tag? I also love March because it means spring break and warmer weather! thanks for this good project!!! I think I’ll try this in March too. Maybe it’ll help to get me back into the swing of things, scrap wise. Count me in too! I *think* that I need to go out now to ACMoore …. thanks!!! This should be lots of fun!! I hardly scrap anymore but when I do it is little books and fun stuff like this. Great idea Cathy……can I ask what adhesive you are using? I usually use the Ultimate but I have trouble starting it up each time (it clogs up at the top). Do you know of an adhesive that won’t make bumps and bubbles? Love this idea – thanks for the templates!!!! great way to inspire us to tell our stories and totally diggin the BG paper – can’t wait to find it!!! i have been trying to get inspired all weekend, thanks to you now i am. love this idea. i am sending out this link to my friends that are having a retreat on the oregon coast in april and then we can all share our project there. Love this!!! I am in.. This is too cool! Count me in! However, Paper Source is already out of the tags….any recommendations on what else to use??? Great project – great idea! I was thinking of trying to incorporate this concept into a tag book…looks like you beat me to the idea…but wouldn’t this be cool. Hemingway, it says on the site, once wrote a six-word story and later proclaimed it to be his best work. His story? “For Sale: Baby Shoes, Never worn.” How poignant is that? question for you, how much were the tags?? On my gosh! How excited am I? This is exactly what I was looking to do this month because it’s my birthday month too!! The 9th to be exact. So thanks for the birthday gift and inspiration. LOVE IT. I’m thinking this is just what I need to do right now. Thanks for sharing. Your cover is gorgeous! Awesome idea ! I’m in !!! Love that new collection from BG – it’s my favorite from all of their new collections ! A question for ‘ya : would you consider making for us francophones templates for those tags in French language ? The months in French are MARS, AVRIL, MAI. The abbreviated days are DIM, LUN, MAR, MERC, JEU, VEN, SAM. Thanks for your continual inspiration !!! I was so glad to see this project. Lately I’ve been needing inspiration to get anything done, feeling like I’ve lost my creative soul. Thanks for putting this together and giving us the jumpstart. Can’t wait to get started! ps – I don’t even need to go shopping for this one! Comment #2: Just used your link to Paper Source for the tags (which I bought YESTERDAY) to double check their size…AND THEY ARE ALL SOLD OUT! They must LOVE you, Cathy! Glad I bought fast! cute and tiny to boot. What’s not to love? I love this idea and am SOOOOOOO going to do this. Such a great idea! I think I’m going to do the month of May because it’s my birthday, Mother’s Day and my husband’s birthday as well. This sounds like an awesome project that you could easily adapt to any month. And can I add I just got an iMac and saving your little pdf was like a dream come true? So freaking cool. You should get a kick back on the tags – they are already out of stock! Whey-hey, you’re back! (Not that you were ever away, of course. Soz.) Love the tags, but can’t afford to be quite as profligate (2 tags per page)with my card! Hope you don’t mind, but I redesigned your glorious tags to fit six of them onto 12×12 card. They’re stacked up and ready to go – so looking forward to this, and thank-you! I’m in. You are awesome. I like your suggestion of winging it. Very fun!! !I’m gain! Printing off the files!!! Cathy – you are absolutely, without a doubt, a fantastic person. Thank you for this idea and the monthly tag downloads. Awesome. Thanks for the idea and the templates. I’m excited about this! I happened across your blog only about a week ago, and am soooo pleased! I bought your ‘Clean & Simple Scrapbooking’ here in NZ a couple of years ago and always go back to it – even though I am not so ‘clean and simple’ the elements I just love and I find it very inspiring. I’m going to try this tag project especially since part of the work is done already – thank for the templates and the inspiration! I really need to use up some stash…great idea! I’m going to Donna Downey’s INSPIRED event in April and I’m pretty sure I will “need” to buy more stuff to stash. What a FUN idea! LOVE IT! this is soooo cool!! i finished putting mine together last night and i’m ready to go!! i’m going with the every-other-day stories so it’s so doable!! thanks for the great idea! Hey Cathy! I just printed out the march tags! My one and only problem which sort of made me sad, but has nothing to do with you, is that my pretty Stampin up paper is too thick for my HPall in 1 printer! This majorly bummed me out cause its so pretty! But Im over it and am happy with the white and brown which I love too! I may make my BB do this as well! I’m in! I love this idea AND since my b-day is also in March, I gave up nicotine and love salt and vinegar chips….what could be more perfect than starting in March! Thanks for the rockin’ idea Cathy. What a great idea! SO in on this one with you? You are so generous to share the downloads with us! Do I dare to ask you to give us January and February too? I’d love to have a whole year to print out from the get-go, that way I’m sure to fill them all in. It’s like striking when the iron is hot! Thanks so much for this whole idea! I’ve already gotten started assembling supplies to get this started in preparation for March. Love it. The tag designs are just so simple, and clean, and brilliant. I’d love a whole year seriesto use in my “year-in-review” book i’m compiling. It would be just perfect…so, y’know in all of your spare time, just whip that out for one of your acolytes! appreciating what i’ve already gotten from you, and never satiated on cathy zielske! This is SUCH a cool idea, Cathy. Any excuse to shop at Paper Source is good for me. You rock! Great idea. I’m going to try it. The tags you are using are on back order, but I’ll just head to the store and get an alternative. I think I am going to get my daughters into the act too. Thanks for the inspiration. this is such a great idea, Cathy!! I’m going to get going on this wit ya’ll. I do have a ? tho…our days are very mundane…meaning the same thing over and over and over. kinda boring actually. help me think of some ideas to write down. You are going to think that I am a liar but after listening to episode 85 of Creative Mom Podcast (at http://www.creativemompodcast.com) while on my walk this morning, I was thinking about making a similar album from shipping tags… I was thinking of combining the shipping tag book idea with the 12 of the 12th idea 🙂 and then I find this on your blog! Fantastic! i love love love this idea…can’t wait to get started Cathy -thanks for the inspiration! Thanks, Cathy. This looks great and manageable, too. I was hoping to be able to take Stacey’s Big Picture class this year but, alas, I still stumble through the virtual world on DIAL UP so it just isn’t feasible. I like projects I am able to download in just a few minutes as opposed to hours! Anyway, I also love the compilation spread you made with photos of you and Dan. Very excellent. This is soooo great. I looove your projects and how cooool is that my birthday month is March too!!!! Well except for the part that I’ll be 40 this year and that I look like a pudgy 25 year old and act like a 9 year old. :p Boy there maybe alot of reflection in these tags. Darn. Can you make one template for Feb? I have alot to get off my chest already! Love, love, love this idea! In fact I just finished putting my book together – can’t wait to start! I love this idea! Thanks for the templates! Love the project idea. I think this will be perfect to help me with journaling more! Thanks for the great idea. Cathy – thanks so much for posting the templates for us! What a great idea! and Wendy P – me too!!!!! Cathy I just want to say THANK YOU!! –your last few posts about getting back to the simplicity of just telling the story, capturing the things that are really important and not getting bent out of shape with the “greatest and latest” hype are just what I needed to hear and the inspiration for projects as simple as this one are just divine! Little steps like this can capture the memories without getting crazy, and I love the way you impart the idea of just winging it! Thank you again, I plan on actually DOING this project!! –and I love that you give us awesome pdf files to work with, such a bonus! Luv it! It is blogging on paper. So much fun! Love this idea and totally going to do the next 3 months worth. Thanks for the great inspiration Cathy. What a great idea! I am certainly going to give it a try. Oh yeah….this little baby is just the little hunk of Slim Jim I needed ; ) I’m SO in on this one, but pleeeeease, keep the months coming!!!!!! I definitely want to do this!! Thanks for sharing the template and look forward to seeing more on the blog!! Great idea. Many thanks for the templates and the inspiration. mahalo cathy!! this is going to be so fun AND cute!! OMG, OMG, OMG!!! This is a GREAT idea!!!! I will SO do this!!! Although, I am going to use some of the tags I bought at staples(I think the box haas 500 in it). I’ve had them for over a year, just *waiting* for this poject!!! YipppiE!!! 🙂 THANKS!! Sorry, about my horrible spelling in the above post! I was just so excited!!! LOL!! what a neat idea. I will dry to do it too. thought you’d like this, an Archibald Prize Portrait Entry of your favourite Neil. I’m sure you could make it your screen saver. I made up my March tag book yesterday and I used my Bind It All to well, bind it. I think this is an awesome idea. I just love the format. I would add 2008 in a really small font for future templates. Just sayin’. Great Idea Cathy. I am always on the lookout for mini-book ideas. One question, can you perhaps make a PDF of the tag template without any words at the bottom? It would be nice to stamp my own options in.Thanks! Love this project. Must do. Thanks. You are so giving and so inspirational Cathy! Thank you for including the templates, I have made up my tag album in readiness for our 18 yr anniversary honeymoon in Fiji this coming May. (18yrs together, 15yrs married), this will be our first honeymoon. Yes. I love this idea. I have been wondering how I could combine my love for writing in my journal and my love for scrapbooking. While a month seems a bit overwhelming for me…I think I am going to try this idea with a smaller project – like Easter week. Thanks so much for the inspiration! I’m late, but in! Always looking for inspiration and this is it! Happy B-Day, Cathy and thank you! Wow, this is an incredible project, thank you so much for sharing the templates! You Rock!